Our "A" litter qualified for NAVHDA NA Breeder Award! I am busy with my real job and I simply don't have the time needed to breed and raise a quality litter in the near future, so we won't be breeding Luna or Liza. We hope to have another litter from Luna in the next few years, when the time is right. 4. Good conformation to the breed standard (it affects health and longevity, not just 'beauty'). Out motto is Breed the best, train the rest! We are a family with 3 SMs located near Toronto, Ontario, Canada. Small Munsterlanders (Kleine Münsterländer in German) is a relatively rare breed in the USA and Canada. However, the breed is popular in its native Germany and other European countries. 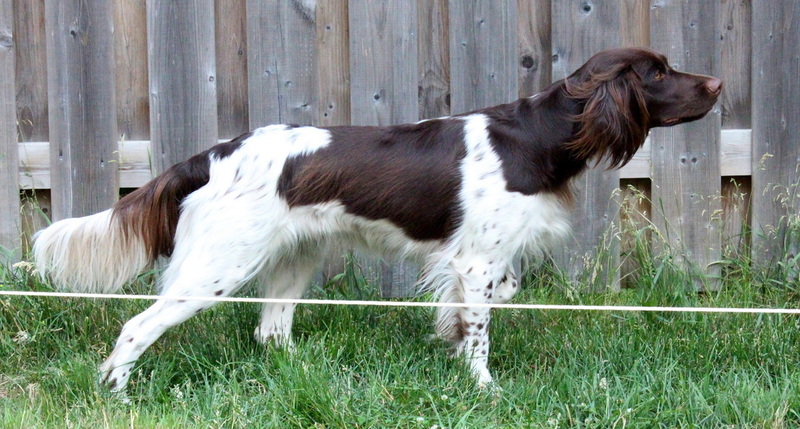 SM are continental pointing dogs, originating from the area around Munster, Germany – hence the name – Munsterlander. As you might have guessed there's Large Munsterlander as well, they're slightly bigger and their markings are black, but they're considered a separate breed. SM are recognized as a 'versatile' hunting breed in North America, meaning that they hunt upland, waterfowl and blood track shot game. They are excellent hunters, family dogs and good with children. SM are very people friendly and smart. Ivy was born in 2010 in Ontario and came to our home at the age of 8 weeks. Both her parents were imported from Germany and came from elite breeding (Auslesezucht). That means the parents passed very rigorous German hunting test VGP among other requirements. The test is ran in two days and consists of 26 events! Ivy has proven herself a wonderful family dog and great hunter. She hunts waterfowl (ducks, geese), upland (ruffed grouse, spruce grouse, woodcock, pheasant, Hungarian partridge, rabbit, hare and turkey) and first blood tracked deer at six months of age! Ivy received Prize I in NAVHDA Natural Ability test with maximum possible score of 112 points. Luna was born in August 2014 in Germany and I picked her up in Frankfurt and took her on a plane to Toronto. Luna is very athletic, confident and has great pointing. She likes swimming and searching for ducks a lot. She comes from elite breeding (Auslesezucht). Luna passed VJP (spring puppy test) in May 2015 and HZP (fall breed test) in September 2015 under JGHV (German testing system). There are more photos of Luna in the blog section of the site. Her hips were certified 'excellent' clear of dysplasia by OFA. Luna had her first litter of nine in March 2017 and we kept one puppy - Liza. Liza (Leeza) was born in our home in March 2017 and she still lives with her mom, so she is having pretty good life :) She passed NAVHDA NA test with flying colors, receiving Prize I and maximum possible score of 112 points. She's very affectionate and cooperative Munster. 1. Do you have any pup or dogs for sale? A: Not at the moment and we don't have any plans to breed either. 2. How much SM pups cost? There's one active breeder in ON Canada, I don't know his current price and some people commented to me they're having trouble reaching him. There are a few breeders in AB and I've heard their prices are around CAD1500-2000. 4. Is the deposit refundable if the buyer backs out? A: Normally it is not. However, in case of extenuating circumstances (loss of job or home, serious illness etc. ), the breeder might, at his/her discretion, refund the deposit or part of it. It also depends on when the buyer backs out, if there are other buyers on the waiting list and on any additional expenses the breeder incurs as a result of the cancellation. 5. What is the cost of importing a puppy to Canada? A: If you're Canadian and you purchase your puppy in the US or Europe, you will have additional expenses. You'll have to fetch the pup (drive or fly). Most American SM breeders are in the Mid West. I do not recommend shipping pups cargo (unaccompanied). On the return you'll have to pay tax (HST for the most provinces), but regular tax exemptions apply (the exemptions cannot be combined for multiple travelers). In case of shipping from Europe, only certain airports handle live animals as cargo. In Germany it's Frankfurt. Someone (usually the breeder for an additional cost) delivers the puppy to the airport. The cost of cargo to Toronto is around 600 euro. Minimal age for cargo shipping is 10 weeks. If travelling in person, a puppy can be transported in the cabin in a flexible pet carrier which must fit under the seat. The cost is around CAD 100. If the puppy is bigger, than the maximum size allowed in cabin, it can travel in a crate in the luggage compartment. The latter option is a bit more expensive, but not by much (can't recall now). Age restrictions vary from airline to airline and so does the carrier size permitted in cabin, based on the plane model. Vaccination requirements also vary, usually small puppies do not require vaccinations to cross borders. 6. What is the process of importing a puppy from Canada to the USA? A: CDC requires the importer to arrange a confinement agreement for puppies which are not yet vaccinated against rabies. It's straightforward process for imports from Canada. There are also state specific regulations, usually by Department of Agriculture. In reality, it rarely comes up during the border crossing.